Jason Iverson's approach is anything but business as usual. Jason Iverson started Iverson's Design Inc. and created the i-Top dodger to combine the benefits of standardized design with the flexibility and responsiveness that customers demand. Photo: Iverson's Design Inc. He likes to make business fun, too. The “extreme product tests” featured on his company website include videos of him getting in a front-end loader and dumping 600 gallons of water on a dodger for a wave test, and conducting a wind test by racing his product down an airport runway at 90 miles an hour. Two of Jason Iverson's passions—product design and sailing—inspired him to launch Iverson's Design Inc., based in Olympia, Wash. His proprietary design of the i-Top dodger combines a modular canvas soft top with a framing structure to create a dodger that protects from the elements—with style. The photo above was taken during one of the company's "extreme product testing" scenarios, with an airplane propeller and a fire hose used to simulate a strong storm. you are always an upholsterer,” he says. After high school, Iverson attended the University of Washington in Seattle, where he pursued his interest in design and completed a Bachelor of Arts in industrial design, along with a Bachelor of Fine Arts in interdisciplinary visual arts. During school, he continued to work in several different upholstery shops and lived his other passion—his home during those years was a sailboat on Lake Union and Puget Sound. At the time, however, he really wasn’t thinking about making anything to do with sailing or upholstery his life’s work. Iverson assumed that, like many college grads, he’d find a job with a corporation once school was over. But as he interviewed for jobs he assessed what he really wanted in life and realized that the artist in him didn’t want to spend his days in a cubicle. He wanted to be his own boss, and he wanted to create his own product. Those passions for design and sailing ultimately came together. Iverson explored a number of possibilities for the product he wanted to create. Through his years working in upholstery shops, he saw an opportunity to design dodgers. By taking advantage of manufacturing efficiencies not traditionally used in marine fabrication, Iverson felt he could manufacture a high-quality product by standardizing it. He also understood what would be appealing to consumers; in short, he felt that he could build a better dodger, and set out to do just that. Working in his garage, Iverson did a lot of drafting and prototyping until he created his signature product, the i-Top dodger, a proprietary design. The design combines a modular canvas soft top with a framing structure to create a dodger that protects from the elements—with style. In 2000, he founded his company, Iverson’s Design Inc., in Olympia, Wash. When designing each dodger, Iverson’s Design considers the uniqueness of each sailboat. Clients specify the height they want and how far back into the cockpit they want the dodger to extend. They also choose from a variety of colors and material choices. The frame design utilizes compression and tension to counterbalance forces inflicted on it, enhancing its structural integrity. It’s connected to the deck with hinge points that pivot to absorb any flex or shock to the canvas dodger and reduce shear on these connecting points. It’s also designed to be more aerodynamic, to reduce windage and add to the structural integrity of the frame. The tensioned canvas skin on the i-Top is an integral component of the structure, and its flexibility helps reduce or cushion the initial impact of a force such as a wave or wind. The rigid nature of the i-Top’s windows creates a distortion-free and wrinkle-free appearance with the clarity of glass. The windows are made of 60 mil., aircraft-grade UV/scratch-resistant polycarbonate material. They’re designed to wear well, remaining dimensionally stable with exposure to solar heat. 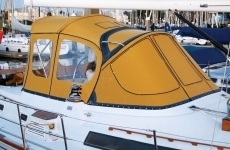 Window configuration also provides a greater wrap-around view from the helm. Iverson says the fact that his company is not a custom canvas shop sets it apart from the competition. “We do one thing well,” he says. His shop has won awards for his designs regionally, nationally and internationally, including International Achievement Awards from the Industrial Fabrics Association International (IFAI), among others. His business model has standardized his company’s processes to the point that staff are able to travel nationwide to provide the product. The company’s nominal service area is Washington, Oregon and California, but Iverson’s has customers as far away as Florida and Lake Michigan. That business model has also enabled his company to provide exceptional customer service, something Iverson feels is essential to his company’s success. “The key to our success is our reputation. Our customers’ experience needs to be something more than they expect,” says Iverson. Those customer experiences include every contact, from the initial phone call to the point when the product is delivered. Customers can begin by using the company’s extensive website, where all the details of manufacturing each dodger are explained, plus detailed information on options for color choices, frames and add-on accessories. Iverson’s Design uses expert teams to complete each task in the process: A road crew specializes in the design and patterning of a project, a layout team prepares the patterns, and a sewing team stitches together the canvas top. If welding is necessary for the project, the welding team is on the job. Unless there are issues with the scope of the project or the weather, installation generally takes place within two weeks of the initial consultation.